PlayStation Access has kindly done a comparison between the PS4 and the launch PS3 console, to show you exactly how the two compare in size and shape. It’s pretty obvious that the PS4 is much smaller than the PS3, but this video clearly shows just how great the difference is. 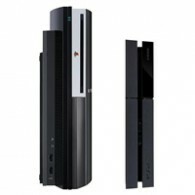 Now, all we need is a comparison with the PS3 Slim and PS3 “Super” Slim models.